I have years of experience with FSX, 2 months with TacPack and 2 weeks with the F-14. I promise I have read the manuals repeatedly. When I go a on a bombing mission I select the bombs in pre flight, put a target into the flight plan (in the case of the attached screen shots KEDW) and fly the plan. I follow the instructions in the tutorial and set all the switches. I begin the run in with the target diamond on the bomb fall line. I get closer, HUD showing 10.1 nm, 1:05 time. 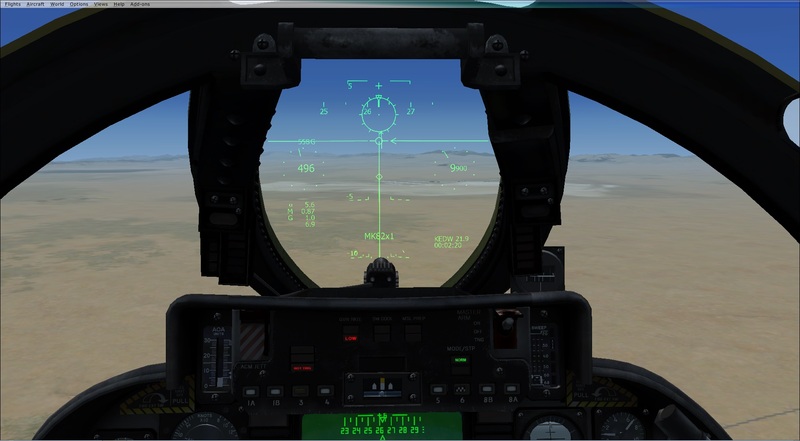 At this point I expect TacPack to put a bomb release circle on the HUD at the end of the fall line but none appears. I don't see any HUD visual cue, the diamond drops below the HUD and I have no idea when to release. Am I missing something or is the A/G release point solely the pilot's judgment and experience? I use the Sparrowhawk HUD and on other TacPack-equipped add-ons it provides a release cue. You will not get a release cue, the mode is CCIP you need to be lower or in a dive to see the CCIP at the end of the bomb fall line and pickle as target and CCIP coincide. I normally fly fly pop up profile to deliver bombs from low level. I could be wrong.. which I am most often.. 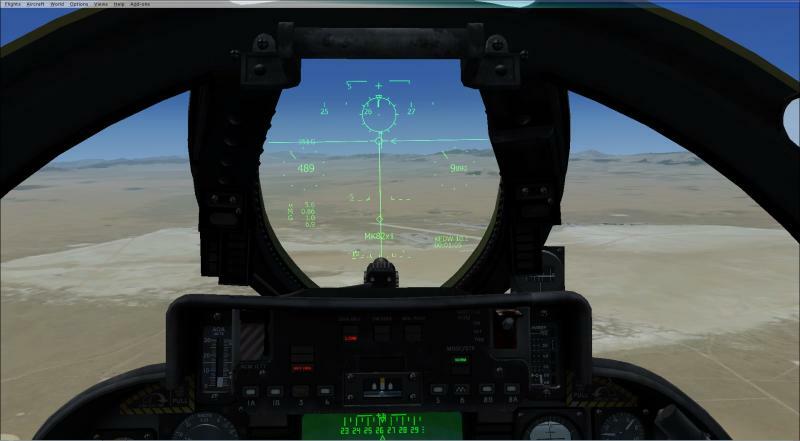 But in CCIP ,, at the end of the bomb fall line is the impact point cross.. which if your in level flight would be below the hud. You would never see it unless you low level. but my way is the same as Weaponeer.. CCIP.. fly low.. pop up.. and dive in. Thanks Weaponeer and Dman, I appreciate your comments. I did try one steep dive bombing and did not see a release indication on the end of the fall line, but I may not have set up the HUD and the run correctly. I did try dropping when the TTG timer got to zero but that was counting down the time to the navigation point, meaning I released directly overhead (approximately 4500' AGL) the target point (the approach end of a runway at KEDW), and of course the forward velocity of the bomb took it to an impact point several miles from the zero time point. I'll work on some dive bombing releases. Thanks again for the responses. You were both right. I made several steep dive bomb runs and as I came down on the target a cross appeared at the lower end of the fall line. I pickled as the cross fell on the target and got direct hits. Thanks for the advice.